"There are people in every time and every land who want to stop history in its tracks. They fear the future, mistrust the present, and invoke the security of a comfortable past which in fact never existed." Robert F. Kennedy, May 1964. So ballot boxes in Iran closed today. There are two major issues here: i) the role of assembly elections in Iran, ii) the boycott of those elections. In electing the Majles-e-Shura, or parliament, Iranians went to the polls against a background of political upheavel in the world of their neighbouring Arab counterparts. These elections are free and fair insofar as they contain a ballot between mostly conservative factions. So not that "free and fair" by our standards at all. Quite easily the most followed foreign news service in Iran is the BBC Persian news service, whose news provision has experienced a doubling in views by Iranians in the past year or so. BBC Persian is an excellent service (if you can read the lingo) but sometimes it reads a little like The Shah's Broadcasting Service, given the apparent loathing of a much younger and obviously pro-western team of journalists towards the brutal regime now in power. So firstly the reality: These elections will not change a great deal. Western outlets are inclined to say "Iranian elections never do", but the fact is that Iran has a vibrant and often vitriolic political landscape in which few figures beyond the Assembly of Experts (those 86 Islamic scholars who appoint the Supreme Leader) are safe from mudslinging and accusations both in the press and on tv. Contrary to the myth, Iranian national politics is not a world of silence and prison terms. Certainly it's a world of knowing when to not push your luck, but it's not 1950s Stalingrad. Iran is not a totalitarian state. This often surprises westerners weaned on a diet of Cold War rhetoric; to be sure, you are not free to call for the destruction of the ruling regime, yet there is a certain zone of debate within the society where opposition is both expected and encouraged. But it's On Their Terms! Cross the line and, like the main opposition parties, you will find yourself under house arrest or worse. Mass executions of dissidents may be a thing of the past, but harrassment, rigged courts, and eventual imprisonment are not. So, onto the boycott: under this curious breed of limited freedom, the candidates for election have been vetted already by the regime. There are two angles to this: i) They don't want a repeat of the mass urban rallies for democracy seen in recent years, ii) This election is about the growing troubles between Supreme Leader Khamenei and President Ahmadinejad. In a nutshell, the majority of reformist candidates seeking a western-style democratic nation will not be in these elections; the state has ensured that this is a contest between long-standing conservative enemies, not between newer foes from within the democratic 'Green Movement'. In a sign of the personal nature of the battle between Supreme Leader Ayatollah Khamenei and President Ahmadinejad, several of the latter's media machines (websites, radio stations, printing houses etc) were this week shut down by the apparatus of the state. The battle is between Ahmadinejad's class warfare pseudo-socialism (heavily backed by young, religious, poor urban firebrands) and the hardline pseudo-rationalist conservatism of the ruling establishment. The only hope for real participation by reformers that "western powers" would like to see in office was shattered by the decision by former Majles Speaker Mehdi Karroubi to entirely abstain from the vote in protest. Karroubi is a remarkable man. Educated at the main seminary in Qom, he cut his political teeth in the nightmare years of the secular destruction of his world by the Pahlavi Shahs, who saw the clerical world of mullahs and Islamic politics as the last threat to their modernising, centralising power base. Almost certainly radicalised by the abortive clamp-downs on religious freedom by the ruling dynasty, Karroubi gained a reputation as a man of humanity in the face of vicious internice fighting which tore Iranian society apart in the Islamic Revolution in 1978/79. He has persistently condemned the ruling council, persistently called for greater freedoms in the press and general society, persistently called for the removal of laws which hold women back, and is now the only major voice of reform left among the ruling Islamic clerical system which contains all final, absolute executive power in the hands of Islamic Jurists - the Velayat-e Faqih political philosophy of Revolutionary Iran under Khomeini. Karroubi is, therefore, the last remnant of the determined moderates such as Montazeri and Shariatmadari, men as utterly different from the horror of former Ayatollah Khomeini as one could imagine. Karroubi is a reminder to the world that Iran's popular revolution to oust the Shah in the seventies was never supposed to end in Khomeini's absolute reign of terror; it was supposed to remove the Shah and the crooks who ran Iran for 40 years with foreign guns, plundering the nation's treasury and enriching themselves alone. It was supposed to rid Iran of a foreign-backed tyrant, not replace him with a homegrown one. Hence it's a tremendous pity Karroubi decided to boycott the elections. I don't think it was the right decision and I think an opportunity has been missed. Yet here's the reality of it all: Karroubi spent years in prison under the Shah's regime, watched dozens and dozens of friends executed by the radical tyranny under Khomeini, has waited thirty years to become the head of the opposition movement, has recently seen his own family attacked and almost killed, and is not about to throw his entire life away on a whim. It's a true shame that the west doesn't balance all this nuclear proliferation crap with some reporting on Karroubi and his followers; they are truly courageous people whom the world should be reading about. The press in the west is happy to report that Ahmadinejad denies the holocaust occurred, but it is strangely silent on reporting those figures in Iran who have publicly, loudly, and persistently mocked and derided Ahmadinejad on national television and radio in Iran's capital. The election today is a battle between the pressured, disorganised followers of Ahmadinejad and the ruthless campaigners of the Supreme Leader. It's likely that some clericalist moderates will pick up votes, but on the whole this is an election aimed at silencing a president whom even the Supreme Leader is now clearly coming to see as a national embarrassment. 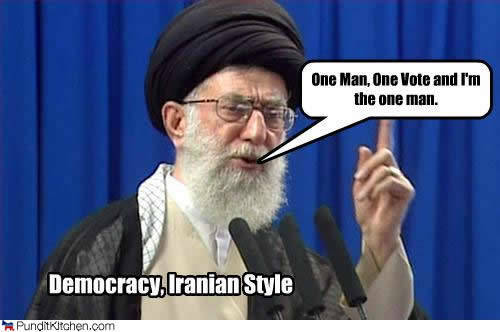 Don't expect to see champagne and mini-skirts in Tehran just yet, but the outcome of this election does indeed matter. If Ahmadinejad's party suffers badly it could spell the end of a truly bizarre political career that has so far survived a regional political renaissance. But above all else I'd advise one position: Never assume that an asbolutely "free and fair" election in Iran would end in the absolute rejection of the traditionalist, Islamic, hardline parties of Iranian public life; Iran is not a nation likely to forget the often noble and self-sacrificial role that the clergy played in ridding the country of western colonialism under the Shah. And whether you like it or not, Iranians will create the nation they want. So crude prices are now at a 43-month high. The initial suggestion seems to be a "rumour" that an oil pipe in Saudi exploded. The Sauds deny this with an odd "nothing to see here" vein of non-statement which I find quite suspicious. You may remember that just a month ago the Saudis, in typically over-the-top House O' Saud fashion, promised to mop up the shortfall in supply that would result if Iran were to cut the Straits of Hormuz. The promise was that Saudi Arabia had enough to turn the Iranian threat into a mere trifle. Well the markets aren't buying it. Stephen Chu (US Energy Secretary) refers to "spare capacity" in the oil supply but he is being horrifically disingenous if not downright stupid. Mr Chu knows full well that Iran is one of the top five oil producers and that China has no intention of playing America's games for it. In other words, what might be a squeeze in Iran could prove a collapse for the teetering US economy. With yet more evidence of western attempts to silence Iranian protestations over sanctions, it would seem highly likely that a major chink in the armour of Saud's bravura is now appearing. Just recently, Press TV (Iran's English-speaking mouthpiece) had its license revoked in the UK under the spurious assertion that it did not have UK registration. Hmm...guess who else has no such "registration" in the UK? Try CNN and FOX. So the upshot of it is this: Iran's brutal regime has already achieved their goal: to put far greater economic pressure on the west than the west can put on Iran. Short of a no-holds-barred war against Iran (for which there is next to no support in Europe nor America) there is little that can be done beyond the common sense of minding our own business where Iran is concerned. Martin Luther once wrote that war is only glorious to those who have no experience of it. In a similar vein, sanctions and imposed deprivation are only glorious to those whose own lives would remain untouched by poverty. Ehud Barak is not a monster. During his period in office as Prime Minister of Israel he oversaw some of the most painful transitions in Israeli politics in the past six decades. He enacted certain steps twowards challenging the far-right extremists of Israeli politics and even had the guts to take on the violent extremists among the "settlers" occupying the Palestinian Authority lands; people that very few ordinary Israelis have any sympathy for. Barak recently entered into a stream of public pronouncements against the Iranian regime which proposed the likelihood of a strike against its nuclear facilities to prohibit Iran from attaining nuclear capability. As has been made clear by the Iranian military (easily the largest in the entire middle east), such a strike would be met with the most severe response imaginable. Israel has enough nuclear arms to attack every capital in the region yet demands no other nation near it have such capability. It has killed physicists and other scientists in Iran and Syria through illegal assassinations. Israel cannot win a war against Iran, Syria, and North Korea (which recently threatened to act against Israel if Syria was attacked again - Cf. "Operation Orchard"). Iran has thousands of missiles capable of hitting Israel, Israel has 42 missiles capable of hitting Iran - missiles Iran is actually armed to knock out before they reach their territory, thanks to Russian anti-missile defence shields. Iran has 70 million people and a colossal standing army. Israel has 6 million people and barely enough soldiers to man its own borders. Fight a war of attrition that will temporarily damage Iran but utterly eradicate the Israeli state. "World War II ended with the Nuremberg Trials. The heads of the Nazi regime, along with their collaborators, were executed. I hope this will be the fate of the collaborators in [the Knesset]." These are the people Barak must pander to in order to get anything done in Israel's cabinet of hawks. Yet let's not completely absolve Ehud Barak of his role in this current debacle with the Iranians. As Minister of Defense he is exposed on a daily basis to operations undertaken by Mossad to deny Iran its sovereign right to pursue nuclear energy and to even pursue nuclear-armed capability; he is in a position to know full well that the Iranian regime is now attaining a greater approval rating among its own beleaguered population thanks to Israel's involvement in attacks inside Iran. The US military has already spoken on the matter - there will be no ground war in Iran. It knows that any such tampering with the oil supply of China, Russia and India will see at least two of those nations supply the arms and technology Iran needs to respond in like measures. For the time-being, the operations of the Israelis remain small-scale precision attacks within Iran against heads of arms industry technocrats. If Israel continues such operations then doubtless Iran will ramp up funding of Hezbollah and Hamas and we will see the return of horrific wars such as that in 2007 when Israel murdered over 1,400+ innocent men, women and children in Lebanon in response to less than ten Israeli deaths. Israel currently preaches the virtue of restraint. If it does not follow its own sermons it will no doubt experience a return to the 1980s, and nobody wants to see that happen. With a full year still left to laugh at the deplorable state of the American right, I find myself not so much laughing as simply stunned. The current game among the candidates is, "Yeah, well if I'm elected president I'll not only bomb Iran, but I'll kill several babies with my bare hands!" One week a GOP candidate says people without medicare should get over it and get a job (literally the exact choice of words made), the next week a GOP candidate is attacking gay people in the military, then another GOP goof is talking about defending the vicious state of Israel "against Iran" as though the business of the State Department is to risk all US troops' lives for this bizarre escapade out in the Negev. I've been dedicating myself to practicing my speed reading of late and the results have been absolutely astonishing. I mention this because at long last I've managed to get halfway through Abbas Milani's remarkable biography of the Shah of Iran (just buy it), a book which calls to mind a billion questions regarding Mubarak, Al-Assad, Ben-Ali, etc. The Shah was a truly tragic figure, in the dramatically pure sense of the term; his life promised much but delivered nothing but sorrow for himself and his country. When grilled about his abuse of Iran's secret service (to spy on the entire nation), he once famously retorted that when the people of Iran "start behaving like Swedes, I will behave like the King of Sweden". The fact is that although there was nothing remotely regal about the Pahlavis (Shah Reza Khan Pahlavi was a soldier, thug, and not much else), Pahlavi-fils was a damned sight more sane than the regime currently winning the diplomatic wars in the middle east. Yet what is immensely depressing about Khamenei is that although I would prefer to despise him, I can't help but admit that he has already won. Russia has confirmed that there will be "no ground war in Iran"; that if Israel continues to pressure the US to invade the Russians will "take action". Lord knows what they meant by "action", but the Russians are about the last straight-talking nation left on earth. If Russia so wished, she could crucify the Israeli economy within six months and it would barely cost the Russians a thing. It also strikes me, in finishing off Martines' superb biography of Savonarola, that Khamenei has merely succeeded in creating the state that a great many of our oh-so-civilised recent ancestors wanted to create. For me, the most interesting recent event in the saga of Ahmadi-Nejad (yes, in Persian his name is two names) versus Khamenei was when the former burst out laughing during an interview with CNN when the interviewer suggested a ground war could occur. Such guffaws of laughter do not for political certainties make, yet with the US financially incapable of launching another economy-busting oil war, Ahmadi-Nejad is possibly entitled to laugh at Israeli threats. All this meandering brings me back to the Grand Old Party and their tragic parade of pizza moguls, semi-literate accidental senators, and religious fruitloops. There is, simply, a political naivete about the GOP front-runners that smacks decidedly of the most puerile and dangerous recesses of American politics. It is pure Bombs Away McClay stuff; a rattling of sabers in the dark in some desperate attempt to appear ever more "American" (belligerent) than the last guy who spoke. Sometimes I just wish Rick Perry would get up in one of these debates and say, "Look, the economy is wrecked, US industry is being destroyed by the Chinamen, the British have slipped away from us out of embarrassment, and now the Arabs have told us where to get off. I don't know jack about global politics but I do know that wars are cool! So let's go get massacred in Iran!!" [Crowd goes wild, Perry elected with 49.2% of popular vote, something said on news about "chits", everyone tunes in to watch the US army get obliterated in the oil fields of northern Iran]. America just looks so weak these days. So helpless and messy. The US needs to drop Israel in a hurry. Washington's Warning From Britain's Past. At university, as a London-Irish boy fresh out of school, I had a lecturer tell me in front of the whole class(after asking where my family was from), that I should go study mining at the other campus because if I did so I'd be able to study the use of explosives: "useful knowledge if you're a Paddy", he added. This was in the nineteen nineties. Being labeled an Irish terrorist in front of my friends, aged just eighteen. Even today, as I write these words, my heart rate picks up and I remember what went through my head that morning: "Yeah...maybe I should just join the IRA". The hatred I felt for that crass, bigoted old fool stayed with me for years. I don't much like it myself, but that's how you create terrorists out of good, honest kids. A week later a male student from my halls of residence pinned a note to my door saying "Sign up here to join the IRA". It was the last decade in which it was acceptable in Britain to call Irish people terrorists "for a laugh". Always the excuse of "humour". The current spate of anti-Muslim rhetoric in US politics is neither a new phenomenon nor is it any surprise. When the Irish landed in America, cartoons depicting them as apes, monkeys and Jesuit spies out to crush America for Holy Mother Rome were printed in every "respectable" paper in the land. The Know Nothing Party launched a murderous campaign of violence and bloodshed against people they said were "anti-American" and "incapable of civilisation". How the times they aren't a'changing. Once the Irish took over US urban politics, the army, and the police force (thereby utterly destroying the Know Nothings) the US press had to find a new enemy. It found the Jews, arriving in the 1880s, to be a perfect target. More cartoons, this time the enemy was an occultist, a thief, a perverter of descent Christian youth, and a banker out to take over America. Looking familiar, isn't it. Then it was the turn of the gays and the actors and the writers, who were clearly all anti-American communists...out to take over America. McCarthy had great fun destroying lives, setting Hollywood against itself, banning books, and locking up innocent people on false charges. Now America has the Muslims, and clearly these people are all bomb-carrying lunatics who wake up each morning and cry out with their first breath, "Sharia Law for America!! ", right? Most Muslims in the west are as dull, honest, hardworking and mundane as the rest of us. Most of them do a better job of looking after their extended families of parents, grandparents and elderly cousins. Most of them actually do better in school, according to the stats out there. Yet I sense something positive in the middle of all these reactionary and ideological fires ripping at the heart of Muslim-American relations; I sense an American public now greatly lacking in trust of this phony "war with Islam". The recent farce in Washington DC where a seemingly jovial and kind-hearted Iranian-American was arrested and accused of a bomb plot to kill the Saudi ambassador has been met by the majority of Americans with outright derision. The power of the internet to inform opinion has been at its zenith in all this, allowing people to connect with news sources which do not sit in the pocket of big business nor in the hands of a corrupted Congress, reliant as it is on lobby groups to get elected. I'm one of the last members of the global Irish community to remember what it was like to be told I belonged to a bunch of murdering savages. I remember very well seeing racist, anti-Irish scrawls on London walls calling for the Irish to be sent home because we all supported the IRA. I remember people who were locked up for no reason under the much-despised Prevention of Terrorism Act which managed to become a recruiting shop for the IRA after hundreds of young men were arrested, beaten up in cells, then chucked back out onto the street after days of false arrest. I'll never forget the day that I saw members of the IRA walk into a packed London pub and do the rounds collecting money. I remember it very clearly even though I must have been only 12 or so. You knew what was happening but if you asked about it you got a glance from a parent that could cut you in half. When, some time ago, I saw a similar event occur I was moved by the difference between the two occasions: this time around, the jar stayed empty and the calendars with republican quotes on them found no buyers; the peace process had ended the desire of so many Irish to have anything to do with "the cause". Yet I remain certain that the current cycle of victimisation of Muslims in American politics will do to America precisely what the Prevention of Terrorism Act did to Britain: it will feed a generation of anger and resentment among younger Muslims which will leave America more at risk than before. I don't state that the FBI and CIA should sit back and do nothing, but the American president and his cabinet needs to be absolutely adamant with regards to any attempts by the idiocy of the Republican party in attempting to make Islam the latest scapegoat in a war promoted for the benefit of the state of Israel. America has gone from being the hero of 1945 to the pariah of 2011, and with the year rapidly heading for a close, the signs of aggression toward a remarkably restrained regime in Iran are deeply disturbing. Iran's leaders do not fear a war; they are among the last truly fundamentalist religious dictators on the planet and although among them are truly good men such as Mousavi and Karoubi, the central leadership of the Supreme Council is headed by men who have no fear of death and have shown themselves capable of sustained all-out war, just as they endured in the war with Iraq for eight solid, expensive years. Whatever one thinks of Iran's desire to possess nuclear capability, one must remember that Netanyahu continues to pressure the US into conflict with Iran and he continues to cleanse East Jerusalem of Arab Muslims who have lived there for centuries before his people arrived. It can be said to be beyond doubt that Netanyahu seeks a continued assault against any nation which seeks justice in Palestine (regardless of its purposes) and in so doing he relies on the US taxpayer to pay for it all, as usual. With daily talk of Iran now accelerating, this is a time for all of us to stop and ask what is truly going on in this extension of the Great Game. Are we, yet again, to be drawn into a false conflict or are we to make a stand against interference in the Islamic world? Who really is our "enemy"? I rather fear that we are losing sight of the fact that, as in the past, our truer enemy is the faction which lusts for violence no matter what the cost. This story absolutely shocked me. I guarantee you it will go completely unreported on any major American news broadcaster. After publicly confirming, with a smirk, that he intends on continuing the ethnic cleansing of Arabic East Jerusalem, after forcing a new and racist oath of allegiance on Arabs in Israel, Netanyahu now very clearly declares war on human rights organisations in that awful little country. He had already made it a criminal offense for any Israeli to boycott goods produced by illegal Jewish, extremist settlers farming stolen Palestinian land, and now this. I don't see how he expects anything but all out war with his Arab neighbours. Now you see why Archbishop Desmond Tutu of South Africa said that the torture of Palestine "makes apartheid South Africa look like a walk in the park". Cameron Faces Rebellion In Parliament. The news regarding the backbench motion for a referendum on Europe is just foolishness. I completely agree with the PM on this: this is a terrible time to be calling votes on whether Britain should remain in the EU. One time pretender to the Tory leadership, John Redwood MP, said that a three-line whip on the vote (whereby if you vote against your party you are expected to resign from your government job) was "unnecessary". Of course Redwood would say that; he wants the lesser imposition of a one-line whip because it would permit Tory MPs to vote against the government and do as they please. The banking crisis in Europe, along with the conduct of President Sarkozy (who this week verbally attacked Cameron in extraordinary scenes), is a perfect example of why we need to back out of funding further EU escapades and handing further powers over to the totally undemocratic, unelected European Commission. The European Commission is basically the cabinet government of the EU. It holds key powers in the hands of 27 completely unelected members proposed by the constituent nations of the Union. Scrutiny is undertaken by the European Parliament, though I'd argue that this is in itself no form of democracy either. I think the backbench MPs in the Tory party are basically a bit bored and looking to vent after years of Labour government and European interference in the British political and legal systems. I'm no fan of the Commission, but with the world facing an economic meltdown I don't think this is anything other than opportunistic timing by MPs who really need to get a grip; if the Euro zone goes into freefall we ourselves will be seriously damaged even though we do not use the Euro in Britain. The only serious option is (and it infuriates me and everyone else in this country) to help bail out these corrupt, disorganised souther European nations and then back out of the whole thing gradually once this crisis has abated. Ed Miliband is using this as an opportunity to snipe at the PM for "pretending to be a eurosceptic". I find that childish in the extreme, and yet another example of why Miliband will probably remain unelectable; it's schoolyard politics. Sure, I want a referendum on Europe, but I don't want it while the roof is on fire. "The future does not belong to those who are content with today, apathetic towards common problems and their fellow man alike, timid and fearful in the face of new ideas and bold projects. Rather it will belong to those who can blend passion, reason and courage in a personal commitment to the ideals an great enterprises of American society. It will belong to those who see that wisdom can only emerge from the clash of contending views, the passionate expression of deep and hostile beliefs. Plato said: "A life without criticism is not worth living." RFK, 1966.